I think I’ve lost count of the number of women who tell me that they run their business from their dining room or kitchen table. If you are one of them then this is especially for you. I know what you are thinking…what’s wrong with that? Well, how many CEO’s do you know who work from a kitchen table? If we want to grow our business like we mean it, then our environment needs to reflect that. We need to have our own space that is just for us and all the personal items that make a workspace our own. Books, files, plants, art should surround us and inspire us and everything you need should be at your fingertips and easy to access. It just doesn’t work when things we need to access are in boxes or cupboards or worse still piled up on a bench. Some of you are probably thinking….oh yeah it’s okay for you because you have a room.Well, let me tell you when we first bought this house I found a little space which was so ugly. The lady who lived here used it as her ironing room. There were bars on the windows, spider webs, and ugly lime green carpet tiles. It’s not even 2m wide but I set about painting it up and creating a lovely space which I could call my own. It has always been out of bounds so none of my family are free to come in and trash it. I value my space and it brings me joy and that’s super important when you run a business from within those walls. Set aside a room or area within the house that is just for you and your business. Set it up beautifully with the very best of everything that you can. Don’t be mean to yourself. If you have a guest room that rarely gets used then take it over. You may even need to use a small corner of the bedroom. You and your business deserve it and it’s not selfish to do so. If you want ongoing success you need to look successful. Hey, you know as well as I do that a dirty space doesn’t make you feel good. Working from home should make you feel liberated and in control and clean glass windows, mopped floors and a dust-free desk top are key. Buy some really beautiful storage so that you have it looking great. Avoid plastic. Buy some beautiful baskets, wooden filing trays, ceramic pencil holders. Also, flat metal tins are great for keeping papers, photos, inspiration and other loose paper items. Keep your workspace clear of other people STUFF including toys, STUFF that has no place to go (maybe get rid of other stuff in your home) STUFF that gets’s dumped there, ugly STUFF, STUFF that you don’t use or particularly like. Ditch books you won’t read…clear the clutter. In my Course Workspace Rapid Room Rescue, I show you exactly how to find your perfect design style so that you are not copying someone else’s style but actually creating one of your own. We also get into the details of how to actually create the organisation in your workspace so you are out of the mess and into your happy, creative place. My course helps you to actually make a beautiful workspace a reality. Find out more here to create a magazine-worthy workspace. Let me know your thoughts below and leave a comment. 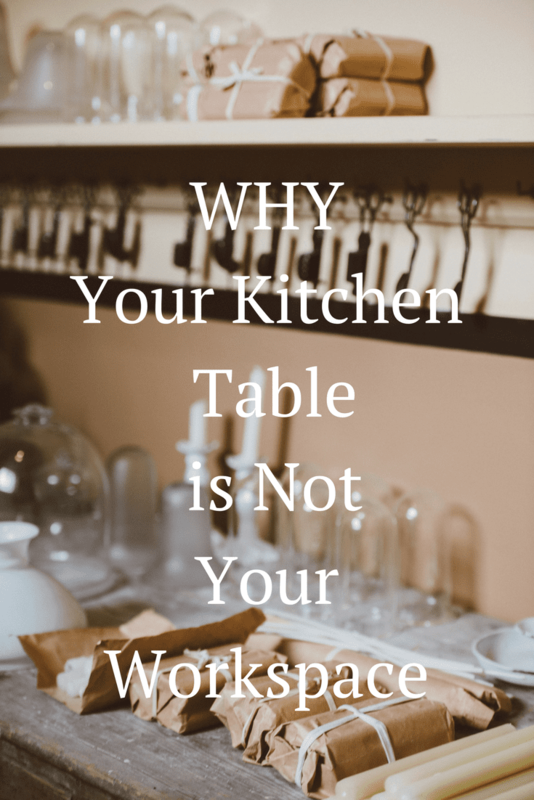 Do you work from the kitchen table?